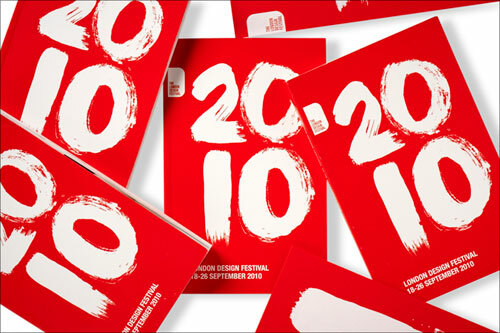 The London Design Festival ends on 26 September. This week over 200 events and installations are taking place across the capital reflecting the widest possible range of design interests. For the fourth year running Domenic Lippa and his team have worked to create a new visual identity ensuring that the Festival brand has visibility across all of its disparate elements. This year’s mark is all about creativity reacting against the formality of last year’s clean typographic approach. Using an intuitive graphic solution led towards a hand drawn painted alphabet created by Beatrice Blumenthal. The alphabet is used to express some impressive facts and figures for the Festival in bold hand drawn figures for instance 300,000 visitors, 200 events and London being the number 1 city for design. These facts and figures are used to adorn the guide as well as T-shirts, bags, advertisements and the website. Four years ago Pentagram designed the London Design Medal whose recipient, Thomas Heatherwick, was announced on 20 September. This year the team designed the invitation for the event as well as the certificate. New visual identity for MIT Media Lab.